In early March, Dr. Michael Pastor PhD, MFT was a guest speaker at PEN. The title of his talk was Family Dynamics in Families with Children with Learning Differences. Dr. Pastor has worked with children, adolescents and families in his psychotherapy practice in San Francisco for over twenty years. In addition, he is currently Upper School Counselor at San Francisco Day School. When a child is struggling Dr. Pastor re-enforced the importance that parents find ways to have fun with their child even though it may not be easy. Why? You want him or her to remember holidays and trips – maybe simply going to the beach. You don’t want your child to simply remember the struggle. He quoted Jane M. Healy, PhD whose book Different Learners as a good source on this topic. Remember: the family we grow up in is the most important environment for a child. If your child is having problems, don’t be one of those parents who just thinks that things will get better on their own. In most cases this is not the truth. Parents get shocked at the complexity and expense of the solutions and often decide to let go the step of an evaluation. This is not helping your child. You may find yourself, like other parents have, that you feel relief when learning the results of the tests. Finally there is a way to improve the situation. Some parents find it hard to hear the results – that their child has problems. And, now they have more to handle which might include the recommendation of medications, or a tutor, or possibly a psychologist. All of this costs money. Some parents feel guilty feeling they should have addressed this issue earlier. They might also sense it’s genetic and feel guilt for having passed it on. Dr. Pastor pointed out that if these feelings are buried and not expressed they will leak out in other ways – anger, fear, even rage. Some parents feel a deep sense of disappointment. Their vision of their child being successful in the way they had outlined doesn’t now seem possible. It’s important to admit this feeling so it doesn’t become toxic. Parents need to develop a new level of dialogue with each other. If this skill is not in place the service of a therapist may be wise. One of the first decisions parents will need to make is who will take the leadership in obtaining for the child what is required. Most often it’s the wife. And, down the road, anger can build up within the wife for carrying this load. And, it’s not uncommon that the dad’s point of view becomes: “If the child only tried harder.”Remember while parents may be disappointed, it is the child who has to deal with the learning challenge. The parents need to find a way to convince the child that they “aren’t lesser than”, especially in context of their peers. One of the new phraseologies “learning differences” can take the heat off the topic and an explanation that some people have different kinds of brains can give the child something to express to both themselves and others. Remember. the conditions of anxiety, depression and low self esteem are more prevalent with children with learning disabilities. Learning challenged kids come to expect that they will fail (That certainly was my expectation with French which being Canadian I had to take through school and university). So, there are both the neurological and psychological issues to handle with the child. Parents need to find a way to help the child not decide that life consists only of being forced to do what you don’t want to do. If there are siblings, they often find the learning challenged sibling a pain. The sibling deals with it by being a good child but harbors secret resentments. And, the learning challenged child will be jealous of the sibling because they seem to have a much easier life. Remember, children are like sponges, they absorb everything. They pick up what parents are believing and how they are behaving. One caution: Dr. Pastor recommends that you don’t tell the sibling not to tell others. That will backfire in ways unexpected. When things don’t make sense, parents look for help and discover that the process of identifying professionals is not easy. The person(s) chosen need to fit both the parent’s and the child’s requirements. Parents begin to see that they have to choose when to be firm and when to let an issue go. Sometimes letting it go makes sense because, above all else, you want to preserve your relationship with your child. While you are making the decision the parent needs to assess: is this behavior something unusual? If yes, letting go might make sense. The result could be the child might feel: finally my parent gets me. The fall out with siblings in that situation is resentment. The child with the learning difference gets more attention. The core solution in a family is good communication within the family. Each person listens to each other. Then, when a reaction happens it is more easy to talk to the child. “I am going to try to help you stay out of being sent to your room” and then give them an explanation waiting to see what they have to say. Often the child feels better simply because “mummy” listens to me. Another suggestion Dr. Pastor gave was to say to the child: ” I need time to think over what you are asking.” However, the parent needs to respond not too much later or resentment will build up. Whatever decision you take the sibling will think it’s unfair. If this happens, be sure to talk to the sibling about it. And the reason is: the sibling might think your avoidance means there is something really wrong. They will hear “this is so bad it can’t be talked about.” And, it may have some truth for the parents because they are so ashamed which then means that the parents have a challenge of working out this shame between themselves. In summary, Dr. Pastor feels the behaviors of the learning challenged child and siblings all starts with the parents behaviors. He stated that there are nearly twice as many divorces in families who have children with learning differences. He cautions: The parents are adults and have to adjust to their children. There is no question that raising healthy children is difficult. Some come out of the womb energetic and hyperactive, while others are quiet. It’s a matter of the parents adjusting to whatever is. Hyperlexia: My journey to understanding the condition. Most parents whose children have a learning challenge look at me with a blank stare when I mention the term Hyperlexia. The same seems to be true with the professionals working in the learning disability field. Why am I concerned you may ask. I am hyperlexic and I don’t want youngsters (or oldsters, as a matter of fact) to be mis-diagnosed or partially diagnosed as I was twenty years ago. It frequently happens. When the tester or the learning disability specialist isn’t aware of hyperlexia they lump the child or adult into the dyslexic category. Why? 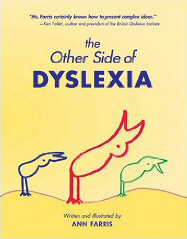 Both hyperlexia and dyslexia are conditions that affect reading. Let’s review. Dyslexia means one has a hard time reading words, sounding them out and probably has a poor vocabulary. On the other hand, hyperlexia describes an individual who has difficulty comprehending what they are reading because the individual is not capable of imaging the words they are reading. Here’s an example. If someone says: the cat has a pink tail that wiggles, a hyperlexic sees the words but not the images of the cat. Imaging gets much more challenging with complex words. I was diagnosed as dyslexic twenty-five years ago when in my forties. The testing office said there was nothing that could be done. I began searching. I discovered quite quickly that I had mastered sounding out words, reading words, and knew I had an excellent vocabulary. It made me wonder. Why am I a dyslexic? No one had a response. I decided that the problem was psychological and embarked on several years of inner exploration. And, I was advised to remove refined sugar from my diet. Both the psychological work and the elimination of refined sugar improved my condition some. In my mid-sixties I attended a lecture given by Nanci Bell of Lindamood-Bell who described the differences between dyslexia and Hyperlexia. I knew immediately that I was Hyperlexic. Yes, comprehension was my problem. Testing at Lindamood-Bell revealed I had Grade Three reading comprehension skills (and I graduated from the Yale University Drama School). When we are talking with another and we don’t understand what is being said we change the subject, or we ask questions hoping that we will get it. We don’t remember what we see or hear and get the person to describe the scene again. We use a word, phrase or sentence hoping we are close to what is being demanded. We take a long time to get a word. I find people get impatient waiting for me to say what I know so I will jump in with a phrase praying I am close rather than waiting for the word to come. We don’t safe in describing what we see. There is so much jumbled in our brain and feel we must rush so we make up phrases. e.g. “There are one too many few.” This was a phrase I said to a waitress when a teenager meaning – there are too many of us and too few chairs. This strange way of expressing myself began happening frequently. My parent began calling them Annisms. Once I discovered the accurate diagnose I took three steps. I signed up for the verbalizing and visualizing training at Lindamood-Bell. http://www.lindamoodbell.com. It was very difficult to learn how to image but I moved myself from Grade Three to Grade Nine reading comprehension level. I worked with the Masgutova Method to correct my reflexes that were not functioning correctly. http://masgutovamethod.com. An individual’s reflexes are developed while in utero and during the first three years of life. I discovered that twelve of mine were not operating at optimal level (e.g.) I was unable to crawl when lying on the floor – my left side reflexes did not work. I decided to combine my emotional issues with the reflex corrections. It was an arduous process but my reflexes corrected over a year and a half. Simultaneously I worked with a friend weekly on reading, utilizing the Lindamood-Bell techniques. It was a painstaking process. Once my reflexes corrected themselves, my emotional behavior balanced itself and I became a more confident as a reader. My friend was truly a saint. In summary, comprehending what I read is still challenging. I have to be bold asking my friends to give me an image or images to describe a word they used when the meaning isn’t clear to me. I hope my experience with Hyperlexia gives you some tools as you help your child or yourself with reading or aural comprehension. My wish is that the term Hyperlexia becomes a common phrase in the learning disability lexicon. And, parents, when having your child tested be sure the testing officer is skilled in testing for hyperlexia. For more information on my experience check out the article I wrote which is posted on this website. http://dyslexiadiscovery.com/dyslexia-hyperlexia-and-beyond.